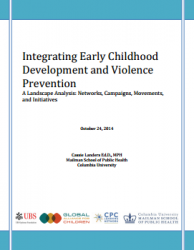 While there is considerable programmatic and strategic overlap between the areas of early childhood development (ECD) and violence prevention, progress in achieving deeper and more sustainable impact by building synergy across the two has been limited. Cross-sector collaboration has been hampered by several significant constraints including divergent definitions, tools, funders, and implementers. A changing programmatic landscape has been severely constrained by a lack of evidence and the few evidence-based programs that do exist often do not communicate their findings, or pursue integrated approaches. Despite these challenges, there is increasing commitment to integrating violence prevention and ECD frameworks, programs and policies. This report, supported by the UBS Optimus Foundation and the Global Alliance for Children, shares findings from a mapping exercise that sought: to identify key networks, campaigns, movements and initiatives; to highlight gaps and opportunities; and to propose recommendations for moving forward.